Officer Jon Key of the Lakewood Police Department never had time to exit his patrol car before being struck by a bullet on July 5, 2014. In recalling the incident Key told everyone that his vest was what made the difference between life and death. He was making a welfare check when he was brazenly shot four years ago. Key was just 32 years old when Gordon Moench stood in front of Key’s police cruiser just as it pulled up and fired off a shot. This was a man wanting to commit suicide by cop. When Moench fired his rifle the bullet blasted through the windshield, striking Key. Thankfully, Key was wearing his concealable soft body armor vest, which is actually not designed to stop rifle rounds. But, the windshield slowed the 7.62 caliber bullet down, so it was not able to penetrate the protective vest this time. The vest Key was wearing was a Level IIIA and he clearly believes the only way the bullet didn’t kill him was because of the windshield. Level IIIA soft body armor vests are designed to be strong enough to keep most handgun rounds from penetrating. But, they are definitely not designed to protect against rifle rounds. Key describes his chest as being a bit “gouged down” where the bullet hit. Without his vest and if an artery had been struck he could have bled out in 10 seconds. 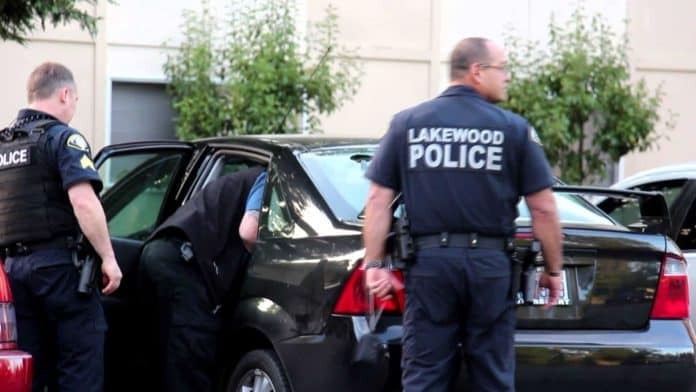 It’s optional for Lakewood Police Officers as to whether they wear a ballistic vest or not. They give officers a stipend of $700 for the purchase of a vest but they do not insist on what protection level they should buy. They do not even make it a requirement to buy or wear one on the job. Key could have chosen a more confortable, lighter weight Level IIA vest, but he opted for a Level IIIA vest and that decision likely saved his life. He and his family are extremely thankful that he chose this vest instead of the IIA. After having been shot, Key went out and bought an even stronger vest, a Level IV, which cost him another $1,000. This one is designed to stop rifle rounds, the same bullet that struck his Level IIIA vest, which is ruined now. It’s a small price to pay for the ability to save his life! Key now works enforcing marijuana laws for the Department of Revenue, which is not as dangerous a job as being a police officer. Even so, the Department of Revenue has given their investigators Level III body armor that protects against non-armor piecing rifle rounds. Key only hopes that more agencies and departments will find it in their budgets to keep officers safer. This is what cops need to increase the survival rates for those who get shot. Anyone wearing a badge these days has a target on his/her back. Gordon Moench also shot another officer besides Key that day, a female officer who took a bullet in the knee. He was eventually convicted of these crimes and sentenced to a prison term of 120 years.